No, it’s not an alien landing. It’s SHIFTPOD2, a tent that will allow you to get some shuteye even in the brightest sunlight. Utilizing a special seven-layer, reflective fabric that insulates from heat/cold/wind/dust/rain/sun, think what a lifesaver this will be during festival season! Also, it’s huge, measuring 12 feet by 12 feet by 6 feet 7 inches tall, so up to 6 adults with sleeping mats can fit inside comfortably. It does weigh 65 pounds which makes it pretty heavy if you’re at a hike-in campground, but manageable for car camping. Plenty of air flow is ensured with 2 doors with bug screens, 6 windows with bug screens, and 2 vents with screens. If you’re traveling with a big group, you can get multiple SHIFTPOD2’s and connect them together with a tunnel system to have your own little commune! 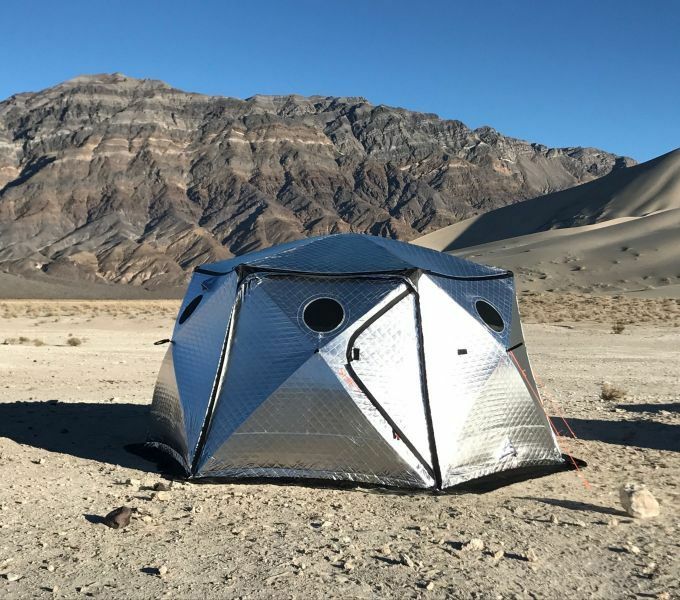 Take glamping to new heights with SHIFTPOD2!